PULL OVER THE CAR, drop your salad (or burrito, in our case), get out of whatever meeting you are in, step off the treadmill for 30 seconds, do ANYTHING you must to grab this if you love pinot, and most especially if you love pinot (or lust it, even) made by one of the most talented, high-profile, high-scoring and coolest Napa Valley winemakers ever --- the legendary Philippe Melka! Good Lord, how did we manage this? Well, we can’t tell ya, but just know that we are working tirelessly night and day to score melon-twisting deals like this for you, ALL the time, because we love you. And today, we present this small token of our appreciation. Totally primo, dude!! Philippe’s resume reads like a “best of” around the winemaking universe. Château Pétrus, Château Haut-Brion, Bryant Family, Dominus Estate, TUSK, Vineyard 29, Dana Estate, Fairchild, and many more of the hardest-to-find, “culty” wines on Earth. Plus, he’s a terrifically cool, mellow dude. 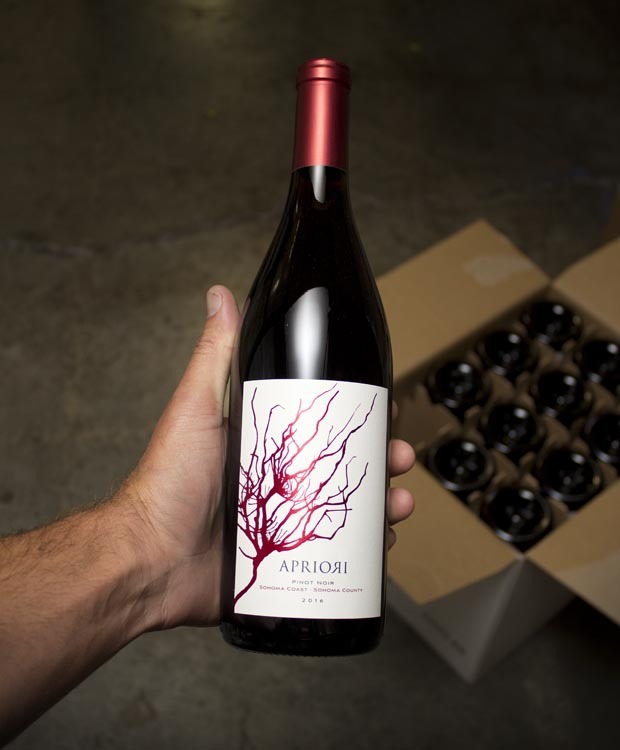 By a stroke of unreal luck, we scored a parcel of his Apriori pinot from the Sonoma Coast (oh, mama…), and, oh, uh….did you get any yet? Not a lot of this one! Clean, bright and singing with cherry extract, clove, cola and licorice whips, this is juicy-ness at its finest. SO RARE to have a Philippe-made pinot! Crazy price! Ahhhh...we’re not saying anything else!! Hurry! Your daily purveyor of fine wines. We’re wine drinkers, collectors, and part of the global wine trade. Mostly, we are totally stoked to bring you incredible juice at the best prices we can possibly obtain, every day. Please complete your payment details. Make this my primary payment method.